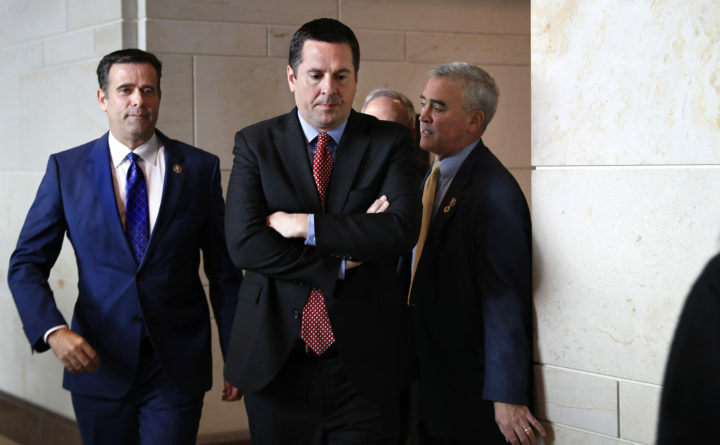 Rep. John Ratcliffe R-Texas, left, and House Intelligence Committee Ranking Member Devin Nunes, R-California, center, leave a closed-door meeting of the House Intelligence Committee to attend a vote on Capitol Hill in Washington, Feb. 5, 2018. My friend Jonathan Chait at New York magazine calls this “bonkers,” and The Washington Post’s Aaron Blake sees “ridiculousness” in the lawsuit, particularly given Nunes’s co-sponsorship of a bill called the Discouraging Frivolous Lawsuits Act. That’s a bunch of bull! Nunes’ naming of a cow as a “defamer” in his lawsuit substantially beefs up the GOP policy stable in otherwise lean times. Dana Milbank is a Washington Post columnist. Folllow him on Twitter: @Milbank.